Alexander Zane Reid Lowe (born 7 August 1973) is a New Zealand radio DJ, live DJ, record producer, and television presenter. After an early career in music making, production and DJing in New Zealand, he moved to the UK in 1997, coming to prominence through presenting on XFM and MTV Europe, before hosting a new global music show on BBC Radio 1 from 2003–2015. He now hosts his own show on Apple's international radio station, Beats 1. Lowe has also developed a DJ career, with sets at various concerts and as a warm-up act for touring bands. Lowe currently resides in Los Angeles with his wife Kara and their two sons. Born in Auckland, New Zealand, Lowe attended Auckland Grammar School and was a presenter on local music station Max TV. Zane was a member of Breaks Co-op, alongside Andy Lovegrove and Hamish Clark. Lowe and Clark formed Breaks Co-Op in Auckland, releasing the electronic album Roofers in 1997 before they both left New Zealand to travel and pursue other interests. Both would eventually develop their careers in the UK. Lowe relocated to the UK in 1997. He initially worked at the Record and Tape Exchange in Notting Hill, before being asked to cover for a show on XFM, going on to host XFM's Music Response. 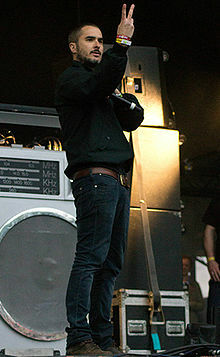 In 2003, he joined BBC Radio 1, showcasing new music from around the world. Also a successful international DJ, he has played sets at festivals including Coachella, Future Music Festival in Australia, Glastonbury, Creamfields and Bestival. He has toured with artists including, Skrillex, The Prodigy, Kasabian and The Weeknd and opened shows for both Muse and Foo Fighters at their concerts at Wembley Stadium. As well as being a regular performer at Ibiza and Mallorca Rocks, Lowe is also Musical Director for the brand, helping to develop and build their artistic and musical output. Lowe started his career on MTV Two (now MTV Rocks) presenting shows such as Up 4 It (1997) and Brand:New (1999). From 2002 to 2015, he presented Gonzo, its flagship music show. The show evolved from a two-hour random collection of presenting and clips, to a primetime (7pm) show featuring regular musical guests and interviews. The show is presented solely by Lowe, with the studio effectively being a blue screen and 'Brown Couch'. His presenting manner on Gonzo is more laid back than on his radio show. The show features music videos, music news and input from the channel's message boards. The show also features mock interview done by a character called Ginger Bloke, in which popular musical artists are humorously "interviewed." Occasionally, moderators of the boards (chosen on Gonzo and by the members) contribute; one member even filled in for a week when Lowe was too unwell to present. At Oxegen Festival 2006, Zane Lowe was reportedly "beaten up" by Didz Hammond and Carl Barat from Dirty Pretty Things on an episode of Gonzo. He has since said that the punch was in fact completely playful but unfortunately, and painfully, connected with his groin. Lowe's BBC Radio 1 evening show was broadcast from 2003 to 2015, occupying a 7-9PM timeslot on Mondays to Thursdays every week. Lowe's method of DJ-ing was high octane and fast-paced, similar to many hip hop DJs, with samples of radio stations, interview clips and Radio 1 stings thrown in between songs, along with the occasional sound of Lowe singing along to the music. A key feature of his broadcasting style was to avoid the use of the fader to reduce the volume of the track being played during intros and outros, choosing instead to talk or shout over the tracks which are played at undiminished volume. The show developed a number of features including "Hottest Record In The World Right Now", "masterpieces" and the "Zane Lowe Meets" interviews, including interviews with Jay-Z, Kanye West, Chris Martin, Eminem and Rick Rubin. On 15 February 2015 it was announced that Lowe would be leaving BBC Radio 1 in March 2015 to launch a new station with Apple. Lowe presented his last show on 5 March 2015, bowing out with 'Song For The Dead' by Queens of the Stone Age, from their 2002 album "Songs for the Deaf". Between 2007 and 2012, one week per year of Lowe's show was dedicated to albums considered "masterpieces". Each show focused on a different album which Lowe and his team considered to be a classic. The first half of the show was dedicated to interviews and an in-depth look at the album's cultural impact, with the album being played in full in the second half of the show. In 2011, during a 21 November broadcast of "Masterpieces" featuring The Smashing Pumpkins, Lowe expressed his delight at securing the opportunity to play Siamese Dream in full, stating the album to be one of his favourites. Three days later, Lowe announced that 2011 could possibly be the final edition of 'Masterpieces', concluding the show with "Hallelujah" from Jeff Buckley's album Grace, stating that the idea of the feature originally came from the suggestion that the album Grace be played on the air from beginning to end. However, Lowe later announced that Masterpieces would continue in 2012, with the four chosen albums being announced on 6 November 2012. Lowe himself stated that 2012 was a slightly different year of selection, in that the team chose albums that were of "pure quality, but [haven't] necessarily featured on any traditional 'greatest albums' lists." At the 2015 Apple WWDC Keynote, Lowe was introduced as one of the DJs of Beats 1, a radio station part of Apple Music. He is also the host of the Apple Music show Planet of the Apps. Lowe has been the recipient of NME Awards and Radio Academy Awards. Lowe has also won the Gold Award in the Specialist Music Programme and Music Broadcaster of the Year categories at the Radio Academy Awards. Lowe recently won the Gold 'Music Radio Broadcaster of the Year' award at the Radio Academy Awards 2014 and, in early 2015, was nominated for a Grammy Award for his writing and production on Sam Smith's hit album In the Lonely Hour. Lowe is remembered for saving Ryan Jarman's life at the 2006 NME Awards, an incident which NME now refers to as "engraved in indie folklore". The incident occurred when Jarman's band, The Cribs, accepted an award on behalf of winners Franz Ferdinand. While on his way to collect the trophy from presenter Russell Brand, Jarman dived onto the Kaiser Chiefs' table and pierced his back with broken glass, narrowly missing his vital organs. He was taken to hospital but discharged himself to return for the show's after-party later in the night. However, his injuries were severe and he fell unconscious in a back corridor. Lowe, a fellow guest at the party, found Jarman lying on the floor bleeding profusely and another ambulance was called which took Jarman to hospital where doctors stitched up the injuries along with the ones the first surgeon had missed. ^ Kiwi-born DJ home for first stadium gig. The New Zealand Herald. 27 February 2011. Retrieved 9 September 2011. ^ "Zane Lowe biography". jhooakley.com. 2012. Archived from the original on 12 May 2012. Retrieved 21 June 2017 – via Wayback Machine. ^ Crawley, Jason (26 March 2003). "Lowe swaps XFM for Radio 1". Digital Spy. Archived from the original on 14 January 2013. Retrieved 21 June 2017. ^ Payne, Chris (25 January 2013). "Coachella 2013: 10 Non – Headliners to watch". Billboard. Archived from the original on 15 April 2013. Retrieved 21 June 2017. ^ "Glastonbury – Zane Lowe Keeper of the hottest records". BBC. 2013. Retrieved 21 June 2017. ^ "Muse Announce Big Names for Wembley Shows". NME. Retrieved 21 May 2007. ^ Stassen, Murray (31 October 2014). "Ibiza Rocks Group launches Croatia Rocks for 2015". Music Week. Archived from the original on 8 November 2014. Retrieved 31 October 2014. ^ Zane Lowe on Dirty Pretty Things Bust-up. YouTube (11 November 2006). Retrieved 9 September 2011. ^ "Zane Lowe: Radio's grand optimist". independent.co.uk. 12 October 2012. Retrieved 28 March 2018. ^ Lowe, Zane. "Zane Lowe's Hottest Records". bbc.co.ukpublisher=BBC. ^ Lowe, Zane. "Zane Lowe's Masterpieces". bbc.co.ukpublisher=BBC. ^ "Jay Z. Zane Lowe. Part 1". BBC. Retrieved 15 July 2013. ^ "Kanye West gives extraordinary interview on BBC Radio1". NME. nme.co.uk. Retrieved 23 September 2013. ^ Stutz, Colin. "Coldplay working on 'Final Album', 'A Headful of Dreams' Says Chris Martin". Billboard. Retrieved 4 December 2014. ^ Elan, Priya. "Zane Lowe Meets Rick Rubin". The Guardian. Retrieved 19 June 2014. ^ "Zane Lowe to leave Radio 1 in March". BBC Newsbeat. 14 February 2015. Retrieved 6 July 2015. ^ a b c d "Zane Lowe's Masterpieces 2007 (Broadcast Date)". BBC. Retrieved 8 November 2010. ^ a b c d e f g h "Zane Lowe's Masterpieces 2007". BBC. Retrieved 8 November 2010. ^ a b c d e f g h i j k l "Zane Lowe's Masterpieces March 2008". BBC. Retrieved 8 November 2010. ^ a b c d e f g h i j k l "Zane Lowe's Masterpieces December 2008". BBC. Retrieved 8 November 2010. ^ a b c d e f g h i j k l "Zane Lowe's Masterpieces 2009". BBC. Retrieved 8 November 2010. ^ a b c d e f g h i j k l "Zane Lowe's Masterpieces 2010". BBC. Retrieved 8 November 2010. ^ a b c d e f g h i j k l "Zane Lowe's Masterpieces 2011". BBC. Retrieved 1 November 2011. ^ a b c d e f g h i j k l "Zane Lowe announces his 2012 Masterpieces on Radio 1". BBC. 8 November 2012. Retrieved 11 November 2012. ^ "Zane Lowe announces his 2012 Masterpieces on Radio 1". BBC. Retrieved 10 November 2012. ^ "Apple – Press Info – Introducing Apple Music — All The Ways You Love Music. All in One Place". apple.com. ^ Brown, Mark. "Arctic Monkeys Look good at the NME Awards". The Guardian. Retrieved 23 February 2006. ^ "Radio Academy Awards Winners". radioacademyawards.org. ^ "NME Awards star hospitalised twice in a night". nme.com. ^ Bassil, Ryan (1 October 2014). "Zane Lowe Has Been Producing For Future, Tinie Tempah and Pretty Much Everyone". Vice. Retrieved 21 June 2017. Wikimedia Commons has media related to Zane Lowe.